Duct Tape Or Dandelion Tape? It’s natural rubber adhesive from rubber trees that gives duct tape its stickiness. Most natural rubber comes from southeast Asia. There are significant environmental challenges in growing and harvesting natural rubber and there is also a constant challenge to keep the rubber tree crop free of disease and pests. 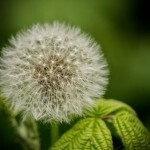 Now scientists many have found a new source for natural rubber-dandelions. There are lots of tests ongoing that make use of the rubber that comes from this common weed. In addition to its potential for making adhesives, there is also work ongoing to develop dandelion rubber based tires. You can read more about this exciting research by clicking here.